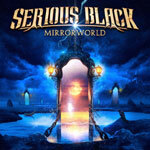 Mirrorworld is the second album by the international unit Serious Black and this piece of work, I think, takes one small step away from the heavy metal foundation presented on the first album and is to a greater extent based on melodic power metal instead. It has a blend of mid-tempo and faster tracks and of course there's also a ballad around in order to diversify the album a little bit more. The band is skilled at getting the melodies in the songs come to life, and especially in the choruses, and whether you prefer calling this type of music melodic metal or power metal the common theme is trying to express sense of melody in an often pretty harmless environment. The production is somewhat weak, the way I see it, and I would have wanted to be hit with a killer attitude and a more massive sound picture overall to feel a stronger connection in that department. Quite a few of the songs bear a resemblance in the vocal melody to Breed's past efforts in for instance Tad Morose and Bloodbound and with these particular songs his voice works the best and he is able to take a specific song to a higher level. Most songs he has been singing over the years kind of capitalize on his characteristic voice and his sense for accurate melodies and when the material on Mirrorworld follow this example too, it can hardly come as a surprise to anyone who is familiar with the vocalist's musical background. I wasn't too satisfied with what I heard during the first spins and it sounded really bland to me at that point. When I am now sitting here writing these words my initial thoughts have turned to the better and today I see this as a fairly good record, even if it doesn't have the full quality to reach the capacity of the first record and is missing out on really awesome songs.